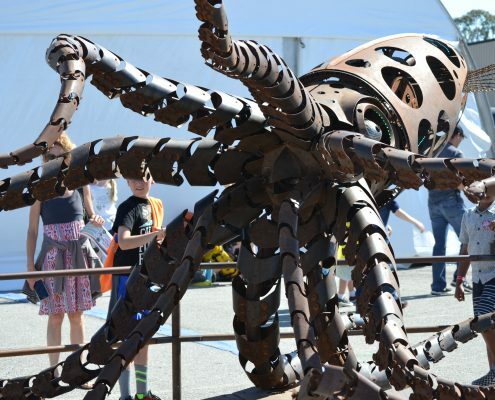 If you are only mildly interested in the MAKER movement, or if you are a beginner maker, DON’T go to Bay Area MAKER FAIRE, which just finished its 2017 gathering from 5/19 ~ 5/21. But why not? It’s a full-fledged 2 ½ day fair that celebrates people’s power to make something using their own hands and brains. It has 1,300 booths and some 150,000 visitors. It’s huge. It has everything from origami to state-of-the-art VR technology, from musical instruments to robots, which can do fascinating jobs, even using simple circuit boards and Raspberry Pi. It’s the epicenter of the maker movement. 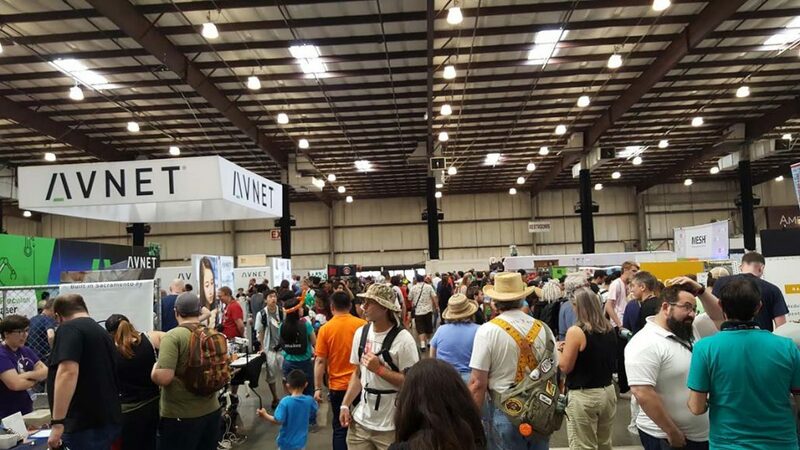 But that’s exactly the reason why it’s overwhelming for a beginner: it’s not easy to engage, mingle and learn at the Bay Area Maker Faire, given its massive scale. First of all, with tens of thousands of visitors on site, it’s hard to advance even 10 yards without bumping into people. Most of the booths and food stands are constantly packed with people. If you don’t live in the Bay Area, and are not used to dealing with large crowds, you end up watching the backs of peoples’ heads the entire time– especially if you are with gentle children who don’t know how to push themselves forward. 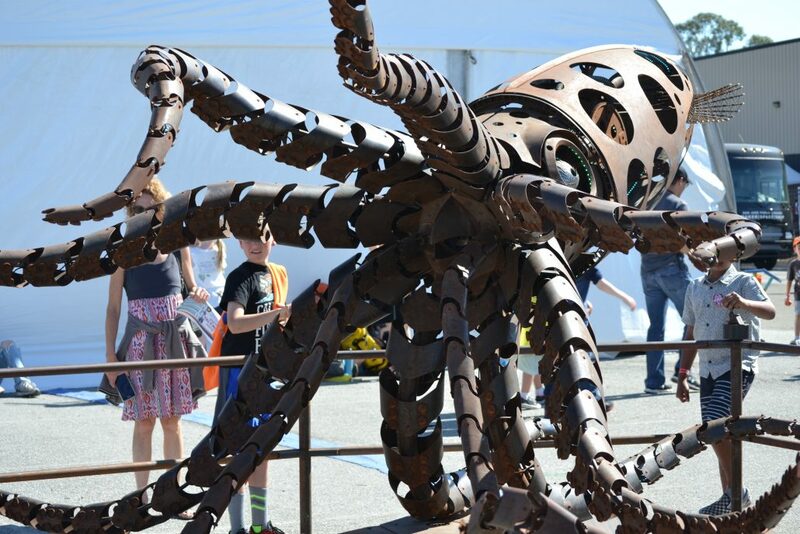 There were ten main areas and many large tents at Maker Faire 2017, but when it takes 10 minutes to travel 50 yards, it’s a daunting task to try to see everything. Plus, information booths are not installed at each tent so you cannot easily find what you are looking for, and you start to feel desperate. It’s like you are lost in the middle of heavy traffic. And most importantly, this is the Bay Area. 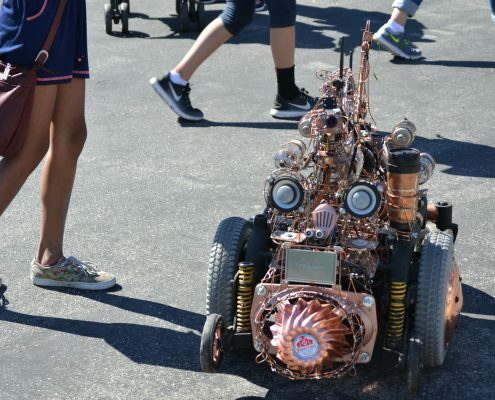 The Maker Faire in the Bay Area never suffers from a lack of talent from people who come from everywhere in the world. There are so many smart people out there. You could easily be overwhelmed by the breadth of subjects and technologies, the level of knowledge, expertise and creativity each individual/organization boasts – including so many young, smart kids. None of the exhibitors look like they are a pure “amateur,” such as someone who solders boards in his garage on Sundays. Even if they don’t earn money with what they exhibit, they are ostensively capable. They are not average people. They are very accomplished makers and probably this is the “World Cup” of makers. 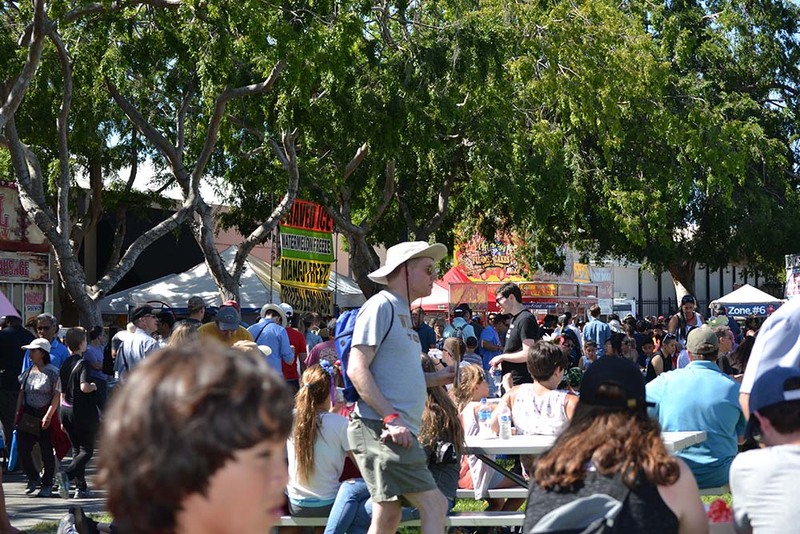 Also because it’s the Bay Area, the fair is sponsored by many big Silicon Valley brands, such as Google and Oracle. So it is already looking like one of those tech expos: people are “making a pitch” here and there. 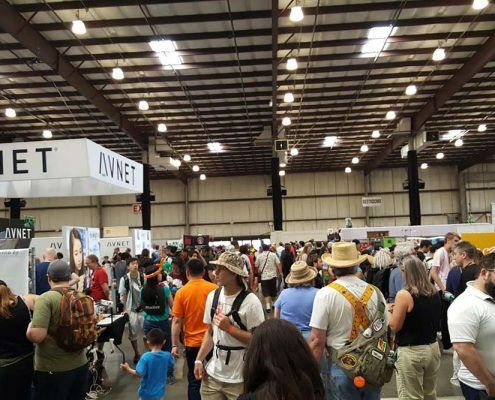 The bottom line is if the original motivation of the Maker Faire was to make and “share,” there is not much sharing happening anymore – unless you are an advanced maker and know how to navigate the whole thing to get what you want. That is the reason why it’s not for a beginner. 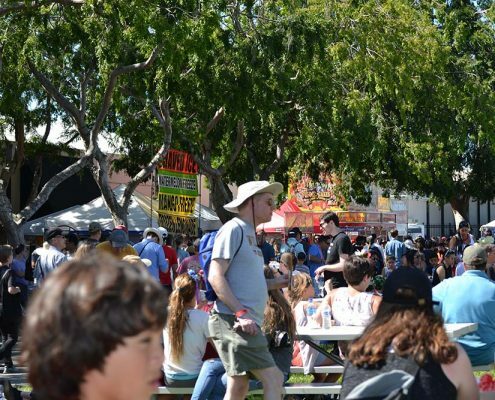 If you find a “Mini” Maker Faire locally, you may want to try it first because it’s much more laid-back, easier to navigate, and not crazily crowded. You can sit down and ask questions, interact, and actually learn something, rather than just being constantly overwhelmed by great talents. 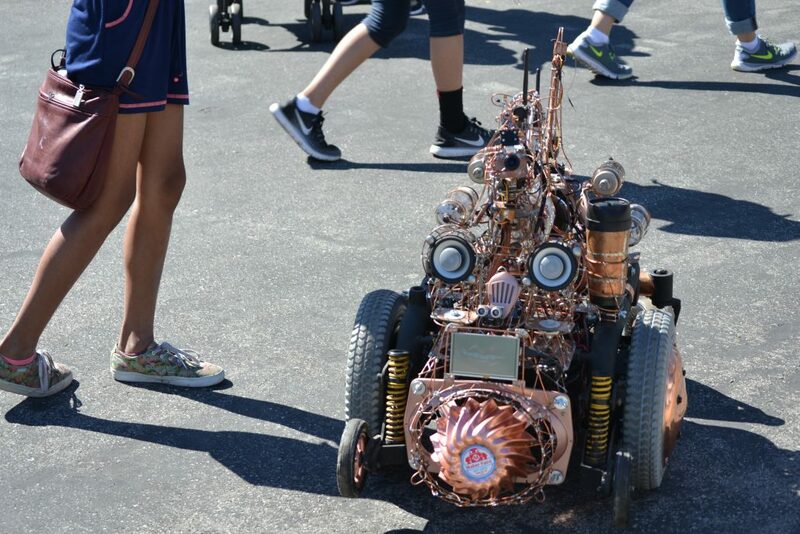 By the way, this is not a criticism for the Bay Area Maker Faire. Resource concentration is one of the core values of economic efficiency. Fair and open markets help us identify the best resources among a vast pool of people or assets. The best resources concentrate and consolidate to enable an efficient and robust system. And it’s what happened to the manufacturing system. Today, big companies with large financial capital attract highly talented workers to make “cool” products, affordably. Whereas we now have easy access to a wide variety of products, thanks to resource concentration and the resulting economic efficiency, the joy of creating and producing something also got, albeit unintentionally, concentrated on the side of large companies and highly talented people. Average users simply became “consumers,” deprived of the excitement to tinker, create and innovate. The maker movement was supposed to reverse the trend, and win back the joy of “making” to our own hands, even though we are not super-efficient, like big businesses. It was supposed to create new communities where people could purely enjoy making something, and share their achievements. But interestingly, as the size of the maker community grew larger and larger, it started to look a lot like a large company. And it seems almost inevitable. When there are so many smart and talented people, momentum just accelerates. When momentum is high, it inevitably attracts investments. When investments concentrate, it becomes an enterprise. An enterprise is already strong enough to “lead” others. If “sharing” can only occur among people with the same interest/skill/knowledge level (otherwise it would be called “teaching,” wouldn’t it? ), then it becomes difficult for a maker’s fair of this size to maintain an intimate sharing atmosphere. This centrifugal force, which attracts strong, competent power to the center of gravity – whether it’s talent or financial resources – and throws off everyone or everything else that’s more diluted, is worth reviewing. When centrifugal force works for the maker fair, it attracts talents at the center of gravity, and throws off everyone else to the sidelines. The reason why a mini maker fair would be more accessible is because the centrifugal force would be much weaker there. It would be easier for people of different skill/knowledge/interest levels to mingle, talk and share. But even a mini maker fair requires money. For it to stay viable, it needs sponsors and investments. It would take a fine balance to keep the size as small as possible, but big enough to raise the required capital to make the fair sustainable. The Japanese House: Toyo Ito Paleo Diet: why does the Stone Age matter?